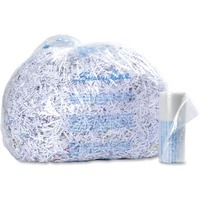 Durable, plastic bags neatly capture shreddings to simplify the process of disposing your shredded materials. Tear resistant construction provides reliable containment of sensitive items. Clear material lets you see inside the bag to quickly determine the fill level. Bags are designed for use with Swingline CHS10 30, CM15 30, CSM11 44, CX30 55, CX25 36, CX22 44, CX40 59, CS50 59, CS39 55, CS25 44 and CS30 36 shredders.